The title, “Digital Remastering,” hints at what is necessary to get to a solution. Each theme entry ends with the anagram of a number (5, 10, 7, 9, 2). You need to adjust those numbers using the parenthetical number in the clues (5-2 = 3, 10-8 = 2, etc. ), and then use that number to identify the corresponding letter in the theme entry (“R” is the third letter in SERGEI PROKOFIEV, “A” is the second letter in MASSENET, etc.). Doing this gives you RAVEL, the answer to the meta. Interestingly, if I had used different numbers in the parentheses and kept everything else the same, I could have spelled out SATIE. Slight controversy this month: At least three solvers thought my clue for IRANI (which I won’t repeat here) was politically charged. Sorry! I try very hard not to include things in the puzzle that might offend people. I wish I had used a different clue. Jim Q Poor ambient musician Brian Eno… he finally thought he’d be promoted to something more than crosswordese- then totally snubbed Surprisingly, I couldn’t find another good classical composer or artist ending in ENO or EON. Anyone have a good suggestion? TeamDelphiRune Was a little disappointed that the final answer composer didn’t follow the same pattern as the theme answers That would have been tough! glasser I thought this was great… except that as far as I can tell, “FRIEDRICH FLOTOW” (without the von) isn’t really a thing anyone says Yup, “Friedrich von Flotow” or “Flotow” are much more common. But I found at least a few references so I thought it fair. Tyler Hinman Brilliant stuff Thanks! m5rammy Was Comb a little hint to an alternate meaning? Nope- completely accidental. ab If I couldn’t unRavel it, I’d have to guess it was five letters from the number of theme words, and then get Bizet finding Verdi guy is Haydn on that Liszt I’m finding this pretty hard to Handel. Pete Mitchell suggests cluing NAIL as [“Another ___ in My Heart” (Squeeze song)] and WARM as [“Here Come the ___ Jets” (Brian Eno album)]. fheaney suggests cluing ELO as [“10538 Overture” band] to go along with the classical theme. Evan suggests cluing KNOX as [One-named punk rock guitarist for the Vibrators] and AISLE as [“Meeting in the ___” (Radiohead song)]. Most solvers liked this puzzle, giving it an average rating of 4.1 stars out of 5. Only 81 solvers managed to find the correct answer, making it the third-hardest of the year. Those that did solve it gave it an average difficulty rating of 3.4 out of 5, and a few mentioned that the fill was a bit harder than normal (probably due to the classical theme). This month’s randomly selected winner of an MMMM coffee mug is Mike Cassidy from Staten Island, NY. 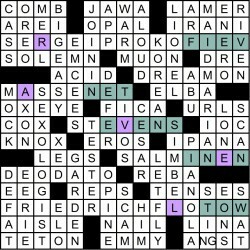 Thanks as always to Matt Gaffney for blogging the puzzle at Crossword Fiend. Next month’s puzzle is probably my favorite of the year, and also probably the hardest. Thanks for playing and see you next month!